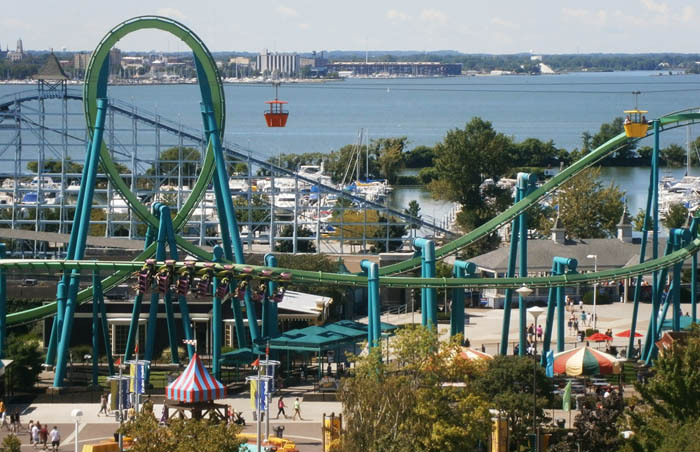 Located on Lake Erie in Sandusky, Ohio, Cedar Point has always been my favorite amusement park because of its overwhelming number of unique roller coasters. We stopped by last week for a two-day visit to experience the thrills. 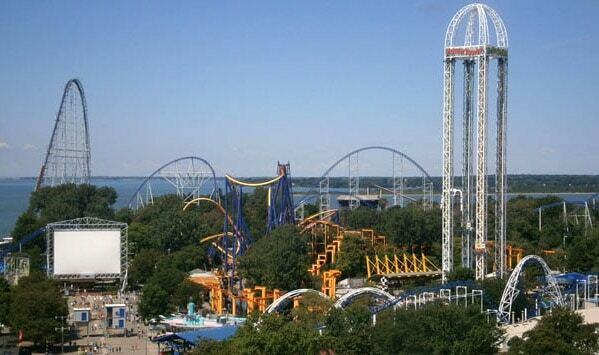 Cedar Point has more rides (75) and roller coasters (17) than any other park in the world (as of 2008, anyway). Riders prepare for a loop on the Mantis, a stand-up coaster. The marquee thrill ride is the Top Thrill Dragster. When it opened in 2003, it was the tallest (420 feet) and fastest (120 mph) coaster in the world. 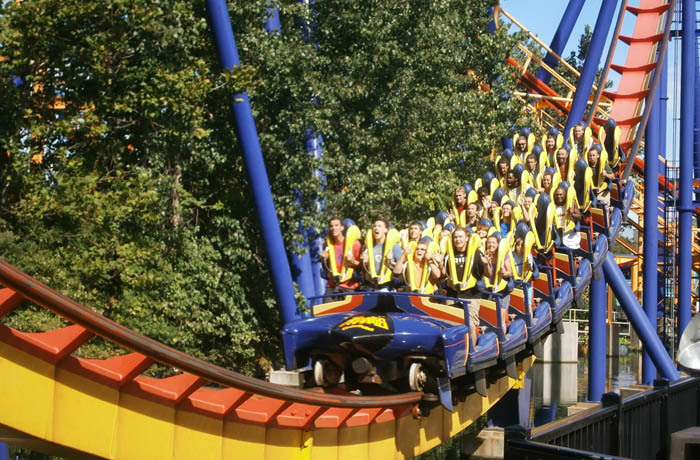 The amazingly thing about this ride is that, instead of slowly building up to a high speed, it starts riders from a dead standstill and then immediately shoots them out at 100+ miles per hour. It’s a feeling I’ve never experienced on any other ride anywhere. You are then sent up a completely vertical arch and back down the other side. The whole ride lasts just 17 seconds, and you may wait in line for an hour to get on. Believe me, it is worth every second! I didn’t get any good pics of the Top Thrill Dragster, but if you’ve never seen it before, watch the video at the bottom of this post. 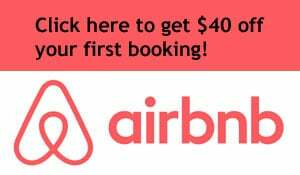 It will blow your mind. 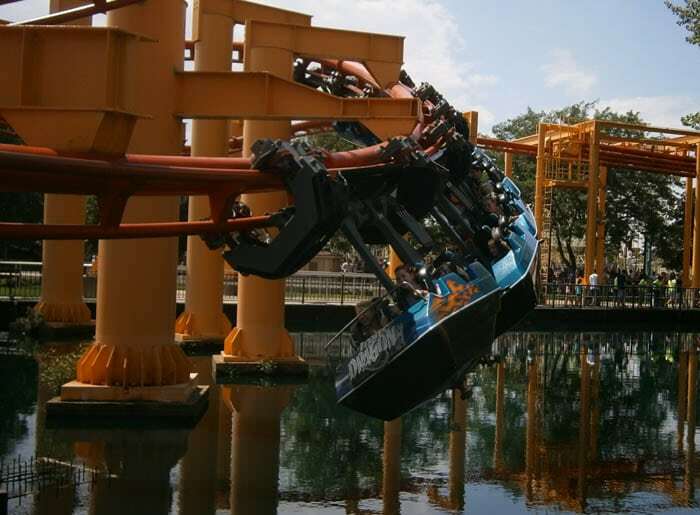 Another amazing ride is the Maverick, which has a drop of 95 degrees. That’s right, it’s more than vertical – the track actually bends back in slightly. When you ride it, you don’t really notice that the drop is so steep, unless you’re in the front seat, and then you realize just how crazy it is! The Iron Dragon races along, just above the water. The Raptor is one of my favorites because it’s one of those coasters where the track runs overhead and your feet dangle below. It runs for more than two minutes and includes several loops and corkscrews. Millennium Force is routinely voted the best coaster in the world. Its 310-foot opening hill is crazy because it’s insanely steep. I’ve never been on a hill that was so steep. You’re pretty much looking straight up as you go up. It’s very disconcerting but fun at the same time. And the ride is incredibly smooth. Settling in before liftoff of the maXair. 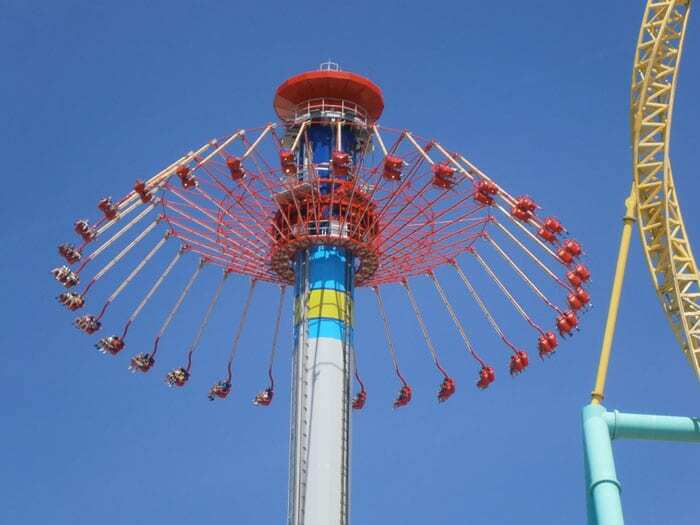 The new ride for 2011 is the Windseeker, which is kinda like a traditional swing ride, except it takes riders up 301 feet before starting the swing process. This ride was a letdown; besides being very short and kind of boring and taking too long to load, the ride made me worry about throwing up. I’ve never actually gotten sick on a ride, but way up there, I suddenly started to fear throwing up on the dozens of people waiting in line 300 feet below. It was also really cold up there! A little bit of altitude makes a big difference. And then there was the Mean Streak, which lived up to its name. 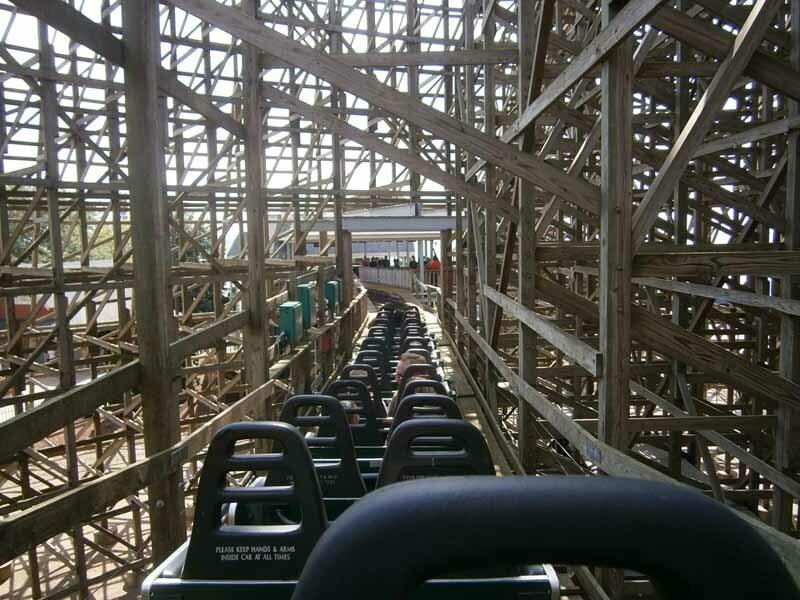 This wooden coaster was so horribly uncomfortable it gave me a massive headache and physically hurt me and my fellow riders by repeatedly thrashing us back against the seats. Here’s how the ride looked at the end; notice how virtually nobody was on it. That should’ve been my clue not to get on. Smart Cedar Point riders know not to get anywhere near the Mean Streak. We visited during the last week in August, unofficially known as “dead week” because the number of visitors is down. We encountered very short lines, allowing us to claim the front seat on almost all the big coasters. We also checked out Soak City, Cedar Point’s water park, and found it to be decent but not spectacular. The highlight was a completely enclosed tube slide called Eerie Falls that was really fun because it was totally dark. We only played a couple of games but walked away with two big stuffed animals thanks to our dart-throwing prowess – a turtle named Hector and an elephant called Larry. Watch my amateur video from Cedar Point. Luckily we had two days to hit them all! Holy cow, man. I get dizzy and whiplash only from looking at this.But then, I guess there is a real thrill in it. Glad you enjoyed it. I like coasters more than the spinning dizzy rides. Well, these rides look way too scary for me!! But I can try some out for sure! 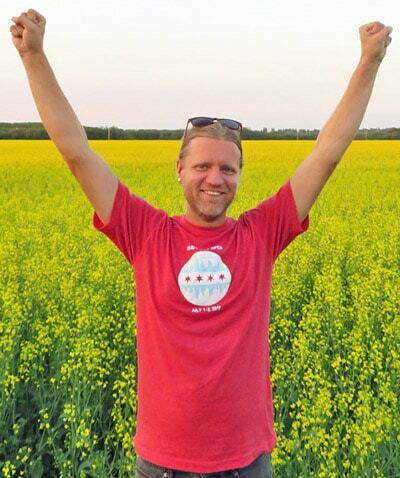 Have a fabulous weekend Scott. Every time I ride a rollercoaster I’m pretty sure I either lose a year off my life or one of my vertebrae. 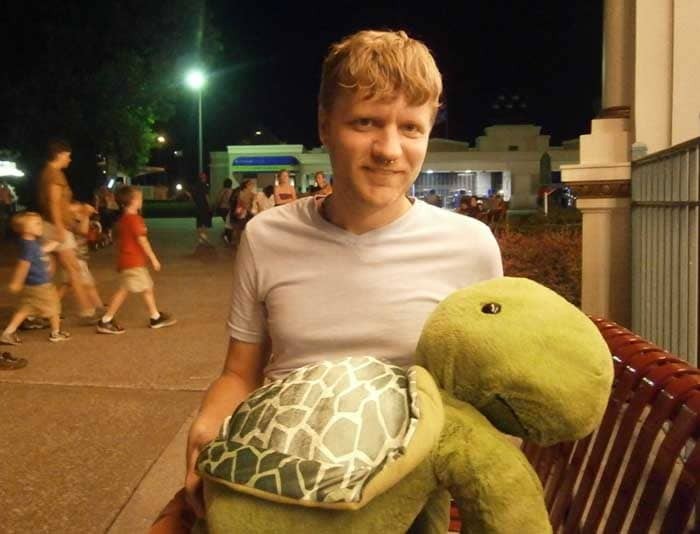 That turtle is adorable, though! Haha, I love coasters now even though I was afraid of them as a kid.